Extra large chamber with private bath - the brightest and biggest chamber in the Mansion. This chamber - Mrs. Cruikshank's original bedroom - is furnished with a beautiful queen-size antique half tester Mitchell & Rammelsberg bed, antique Herter Brothers parlour suite, and original brass electric lighting fixture and sconces. The chamber also features an original Delph tiled fireplace. The private bathroom is outfitted with original J.L. Mott Iron Works fixtures, including ceramic Roman tub, embossed high-tank pull-chain china toilet, two pedestal china sink, and a very unusual china Sitz bath. Large corner room features beautiful antique furniture, including half-tester bed with feather mattress and large seating area. Adjoining bath has original circa 1899 fixtures from the JL Mott Iron Works, including clawfoot tub, high tank toilet, etc. Large chamber with private bath. 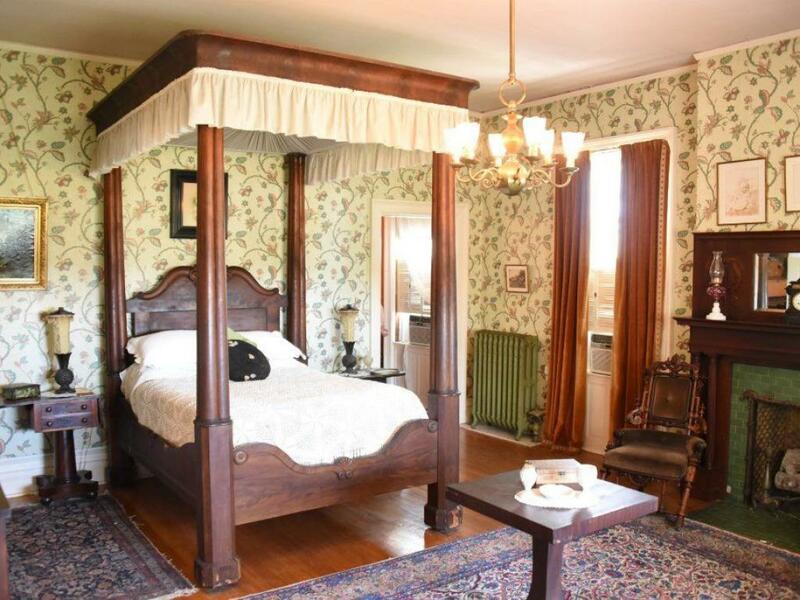 This chamber - Mr. Cruikshank's Master bedroom - is furnished with a beautiful full Tester bed (full size bed) original to the Mansion and attributed to American furniture maker P. Mallard, antique Persian carpets and other antiques. The chamber also features an original tiled fireplace and original brass electric light fixture. 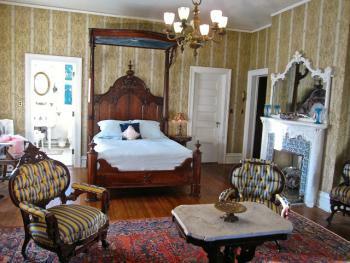 This chamber is accompanied by a private bath - the Mansion's original Master Bath - outfitted with original J.L. Mott Iron Works fixtures, including ceramic Roman tub, china two-pedestal sink, and embossed square high-tank pull-chain toilet. 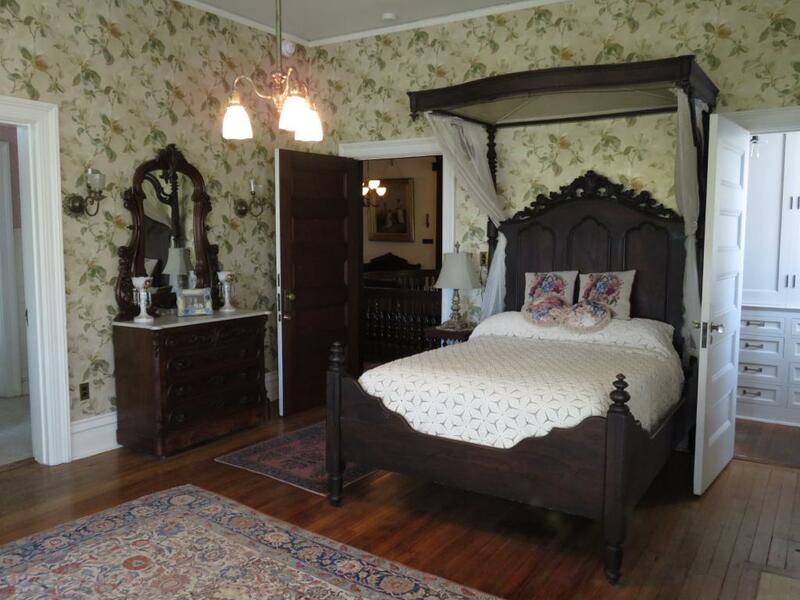 Comfortable room with private bath (outside the room) - located in the original servants' quarters on the 3rd floor of the Mansion. This lovely room is furnished with a (full size) antique bed of historic provenance, an original in-room J.L.Mott Iron Works two-legged china sink, antique Persian carpet, gas and electric combination brass light fixture, and other lovely antiques. Completely restored (to original ) private bath, conveniently located directly adjacent to (but outside) the room, accessible from the hall, and equipped with a J.L. Mott high tank pull chain toilet, china sink, and cast iron claw foot tub (plumbed with a luxurious 1800's rain shower). Lovely bedroom on the 3rd floor. 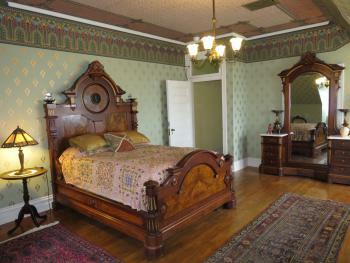 Amazing queen size Victorian bedroom set, antique Persian carpet, original light fixture, and other antiques. Completely restored private bathroom outside and adjacent to the bedroom. This suite combines the beautiful Gladys' and Josephine's Chambers and shares a common original bath. The Gladys' Chamber is furnished with a beautiful antique pre-Civil War half-tester bed (full size bed), beautiful antique furnishing, and an original Italian tile fireplace. 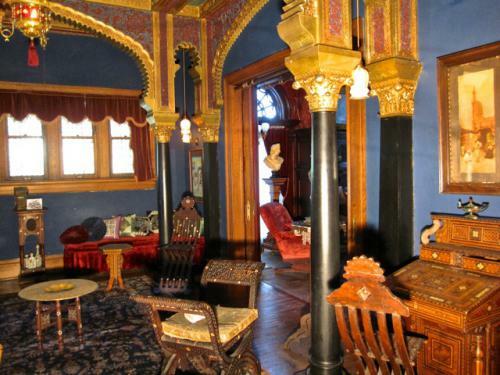 Josephine's Chamber is furnished with an antique full size bed, dresser and writing table made by Pottier and Stymus, and other antique pieces including lovely Persian rugs. The bathroom is outfitted with original J.L. Mott Iron Works fixtures, including ceramic Roman tub, ceramic two-pedestal sink and embossed high tank pull-chain ceramic toilet. This suite of chambers - originally Mr. Cruikshank's bedroom and daughter Helen's bedroom, and the private bath between them - comprise the Cruikshank Suite. This Suite shares the Mansion's original master bath. Mr. Cruikshank's Chamber is furnished with a full tester bed original to the Mansion, attributed to American furniture maker P. Mallard, antique Persian carpets, and other antique furniture. The chamber also features an original tiled fireplace, and original gas/electric combination lighting fixtures. 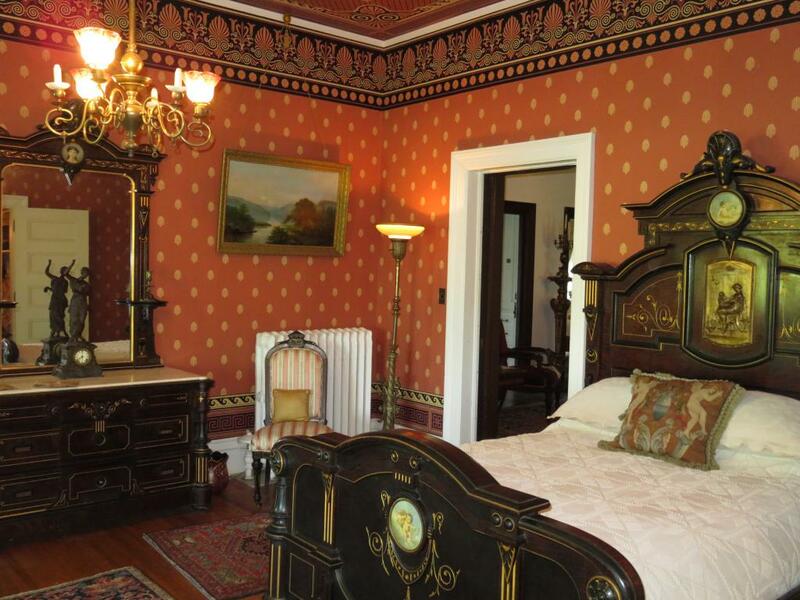 Helen's Chamber is also furnished with antique furniture, including Mrs. Cruikshank's original bed, as well as a tiled fireplace and an original gas/electric combination lighting fixture. The bath, opening to both chambers - is outfitted with original J.L. Mott Iron Works fixtures, including ceramic Roman tub, ceramic two-pedestal sink, and square embossed high tank pull-chain ceramic toilet. 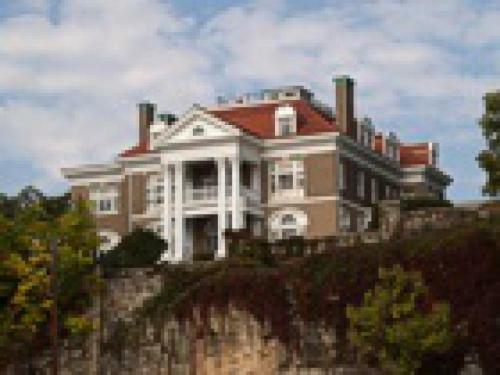 Rockcliffe Mansion is a Gilded Age Mansion located in Hannibal, Missouri. The house was built between 1898 and 1900. 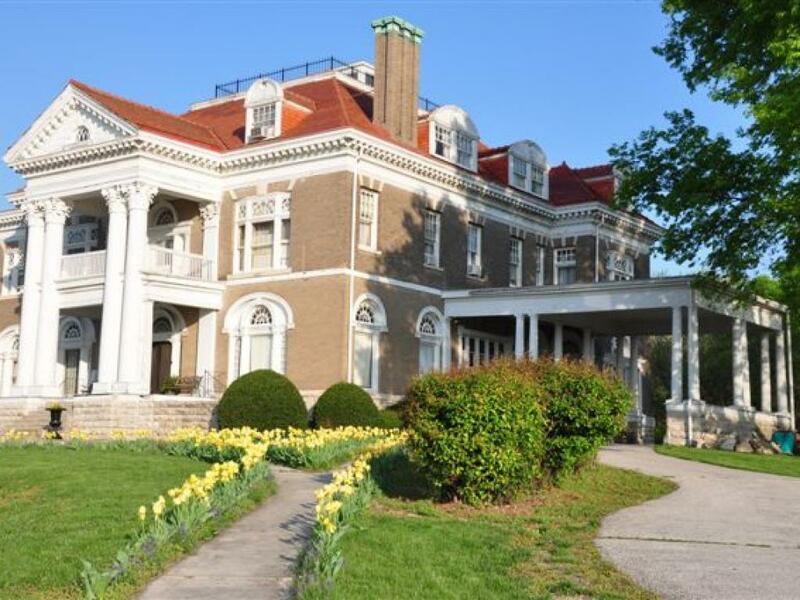 It was built by John J Cruikshank for his second wife and four daughters. The Cruikshank family only lived in the house for 24 years. The Mansion remains vacant for 43 years with all the content and it was saved from demolition in 1967. 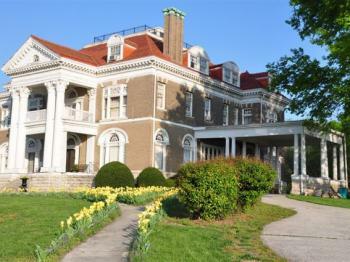 The Mansion exhibits most of the original furnishings as well as light and plumbing fixtures. It contains a vast collection of Art and Persian rugs. As a House museum we also offer guided tours, which are complimentary to our Bed and Breakfast guests. So they literary spend a night at a museum. From 5 to 6:30, we offer also a wine and cheese reception for our B&B guests.